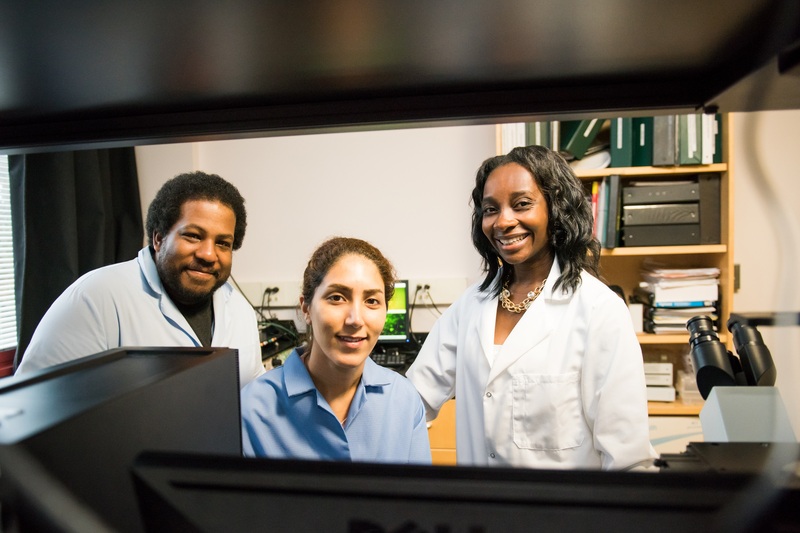 UMBC’s Gymama Slaughter will develop a bioreactor to extend the viability of lifesaving human organs as they await transplant through a major new grant from the U.S. Army Medical Research and Material Command. Funding for the project totals nearly $1.5 million for a period of three years. Slaughter, associate professor of computer science and electrical engineering, will collaborate closely with Warren Grayson and Gerald Brandacher, both associate professors at Johns Hopkins. The team will create a bioreactor integrating in-line sensors, mechanical stimulator, and blood perfusion system to more accurately and continuously monitor organs as they are transported for transplantation. They will also “develop a system that closely mimic the organ’s natural environment,” explains Slaughter. Currently, organ and tissue donors typically need to be in close proximity to transplant recipients due to limitations in organ transport. Some organs are only viable for about six hours, and they must be kept at very cool temperatures to remain viable, so the transport process can be a race against time. With technological improvements, Slaughter says, the viability of the organs could be increased to about 36 hours, greatly expanding the distance an organ could travel from donor to recipient, and the likelihood of a successful transplant. Gymama Slaughter, right, with Joel Tyson ’17, chemical engineering, and Zahra Ghassemi M.S. ’17, chemical engineering, in her lab. Slaughter will focus on developing the metabolic sensors to continuously monitor the organ’s nitric oxide and oxygen levels. Grayson will create a mechanical stimulator to keep the organ moving during the transportation process, so the organ tissue does not become rigid and die. Brandacher will develop technology to continuously supply the organ or tissue with blood, to maintain viability, and will focus on the clinical aspects of the grant. “This interdisciplinary research will enable us to tackle complex organ transplant viability problems to create the next big breakthrough platform technology for extending and monitoring the viability of organs to improve patient care,” says Slaughter. Together, the researchers hope their work will lead to a new era of successful human organ transplantation, saving the lives of wounded soldiers and others in need of transplants in hard-to-reach locations around the world. Slaughter’s work was highlighted in the Baltimore Business Journal, The Baltimore Sun, and The Baltimore Times. Banner image: Gymama Slaughter. Photo by Marlayna Demond ’11 for UMBC.